i'm working on a project for university: i want to shoot a small amount of water into my mouth from a short distance. At the end, the device should hang on the wall and fire, when i'm at a certain distance (about 40 to 60 cm). I've heard about laminar flow & jumping jets before, so i thought this could be a good start, since i want the water to just hit the mouth and stay dry! So i went to the "Baumarkt" and started building. Since this is just a first test, i tried to keep it cheap. As you can see in the Video, the stream breaks up at about 20cm. 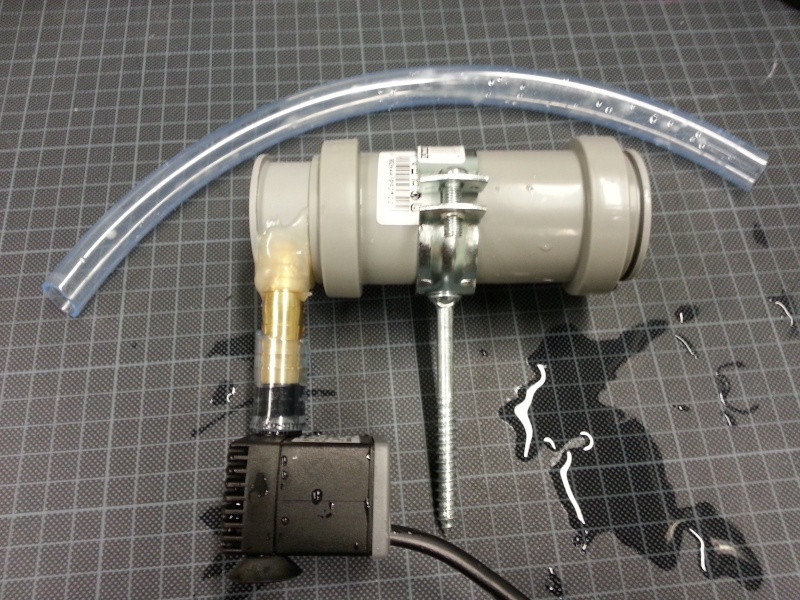 After making the video, i connected the pump directly to the nozzle and that helped a bit, giving me 30 cm maybe. The Nozzle has a diameter of about 4mm. Do you have any suggestions on how to get the stream longer without having it breaking up? 60cm would be my target! Thanks for all the great projects, i really enjoyed looking through them! A nice little nozzle you made. I can se the picture you got of the output from the inside of the nozzle. The metal you drilled a hole in shoul fill the tube. so you have a smooth surface with the hole in the middle. When its like you got the whater hits the edge and can make turbulens i think. And is your output drilled like a V?? and not just a hole. The bottom of the hole should be as sharp as possible. » Beetles on another cracking tiny cabbage?